This will be the fourth edition of our Summer Festival where beer and friendship is our motto. The first Pub in Italy since 1964 where entire generations of Italian and international tourists come every year to celebrate this Festival renewed and improved. Here are the highlights of the Rose and Crown festival. A big stage on the seafront of Rimini, Marino Centro, between the beach and the pub, with a sea view which creates a unique magical atmosphere. The participation of international artists. 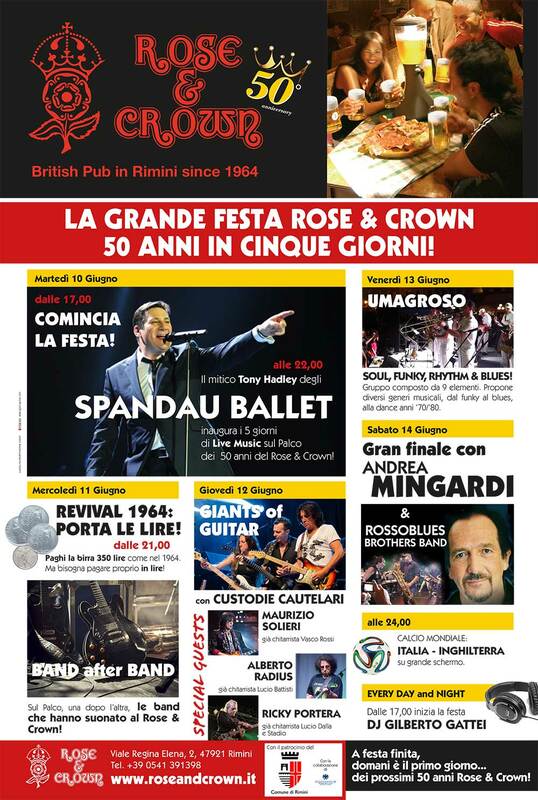 The Rose and Crown Summer Festival is free , like the tradizionale events organised by the Town Hall such as Notte Rosa and New Years concerts etc etc. The structure of the festival is a series of consecutive evenings organises for every type of audience. The concerts are for all ages and tastes. The 2014 edition started with the celebration of the 50th anniversary of the Rose and Crown, during which for one evening, returned to 1964 and sold beers at the price of the time, of 350 Lire. It was an unpredicted success, and thousands of people with old currency came to celebrate with us. On the day of the festival, several famous International artists performed, including Spandau Ballet’s Tony Hadley, Giants of Guitar, Cautelari’s Cases, Andrea Mingardi, Maurizio Solieri, former Vasco Rossi guitarist, Alberto Radius formerly “Formula Three” and guitarist Lucio Battisti, Ricky Portera already guitarist of Lucio Dalla and the Stadio and Umagroso. 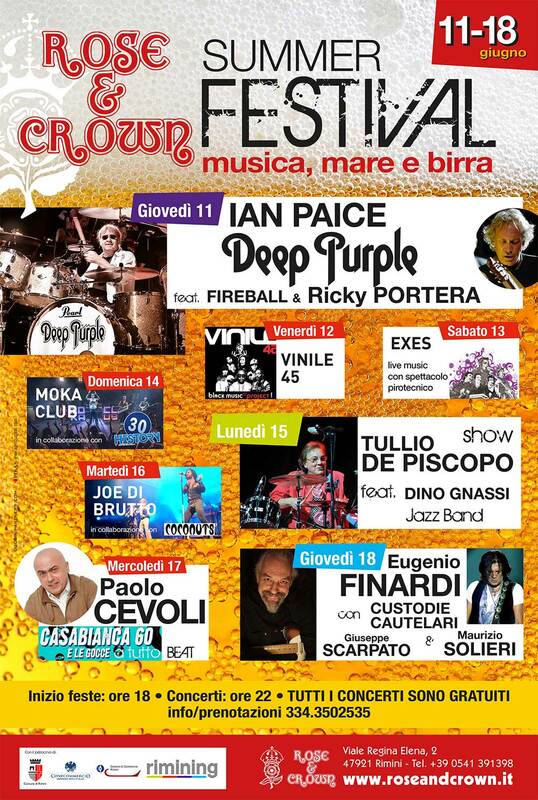 Also in the 2015 edition performances from Internationally renowned stars: first night with Ian Paice of the legendary DEEP PURPLE, featuring Fire Ball and guitar by Ricky Portera, guitarist Lucio Dalla and Stadio; Then Eugenio Finardi with Cautelari Custodies, Giuseppe Scarpato and Maurizio Solieri, already Guitarist of Vasco Rossi; Tullio De Piscopo, Paolo Cevoli, Vinyl 45, Exes Moka Club, Joe of Ugly, Casabianca 60 and Drops; Dino Gnassi Jazz Band. The third edition featured, among others: XSM-Ex Simple Minds, a band that emerged after the breakup of some components of the original famous Scottish group, which today composes of Brian McGee, Anthony Seaman, Joseph O’Neil, Gary Irvine, Owen Paul McGee , Giuliano Palma, Guitarist Matt Backer (by Elton John and Joe Cocker), Mario Schilirò (by Zucchero), Giacomo Castellano (by Vasco Rossi and Raf), Ivan Cattaneo, Johnson Righeira, Rubber Soul, Ridillo and Hot Boogie Trio 45. 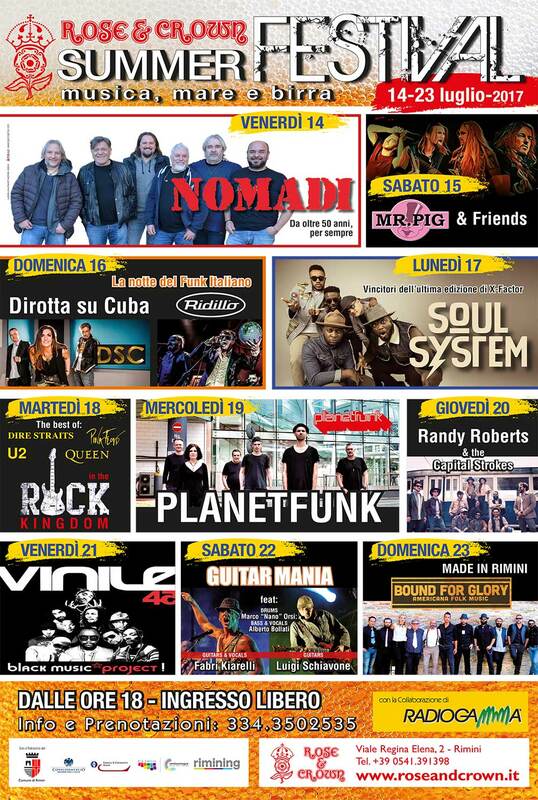 The Rose & Crown Summer Festival, at its 4th edition, has now become a reference event in the Rimini summer event program. The usual billboard of internationally renowned artists and guests, the evening of the festival that became 10 and the positioning in July rather than June ended the 2017 edition with over 100,000 attendance. 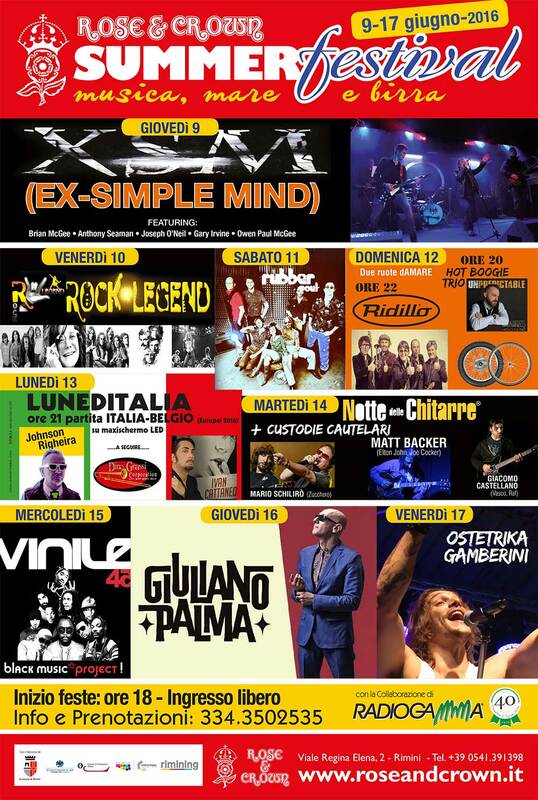 The artists of this edition have been: Nomadi, Planet Funk, Soul System, Dirotta su Cuba with Ridillo, Filippo Malatesta, Randy Roberts & the Capital Strokes, Vinile 45; Guitar Mania with guitars by Fabri Kiarelli and Luigi Schiavone, Bound for Glory, Mr. Pig & Friends, In The Rock Kingdom.